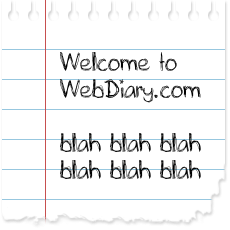 WebDiary.com is roughly two thirds technical reference library and the rest personal rants and satirical observations. While most of the techie stuff is really here as an aide-mémoire for my good self, I hope that some of it might be useful to other frustrated souls looking for help with an obscure technical issue. If I have helped you please leave a comment so I know it was all worthwhile. In case it wasn’t immediately obvious, I do write under a nom de plume since some of my opinions wouldn’t necessarily be endorsed or appreciated by my employers. Although it wouldn’t take much investigation to reveal my true identity, I would appreciate keeping it under wraps as it gives me more journalistic freedom.